How could it have been 20 years since high school? After all, it’s not like I graduated, went to college, went to grad school, got married, got a job, moved to Seattle, bought a house, went to my 10-year reunion, got divorced, bought a condo, got married again, sold a condo, had a kid, quit my job, and found another or anything. I mean, I hadn’t even cured cancer yet or gotten my Nobel Prize, or, more importantly, lost the 20 extra pounds I’ve been carrying around since Kiddo came along. I did remember to get my nails done and my eyebrows waxed, though. So that should have counted for something. High school had its highs and lows for me. I got to develop my writing skills and was selected editor of the school paper for my senior year. I successfully auditioned for the chamber choir and the colorguard, even if I never realized my secret dream of being a cheerleader (yes, seriously) or had a date to Homecoming. I had friends in high school, but only one really close friend. I spent a lot of time convinced that the other girls were snickering at me behind my back, and maybe they were, or maybe I was just being paranoid. But really the lows weren’t all that low; it’s just that when you’re a teenage girl living through them, it feels like your social standing is going to determine the rest of your life. I was looking forward to the reunion in spite of, or maybe because of, those insecurities. Heck, I wanted to show everyone that I was no longer the nerd who couldn’t get a date. Yep, I’ve moved all the way up the social ladder to Software Geek. At least I had a hot date to parade around. As the reunion got closer, though, I started getting nervous. What if no one remembered me? Worse, what if they remembered me, and didn’t want to talk to me? What if my clothes still weren’t cool enough? What if once again I tried too hard to get people to like me? I honestly did want to go, but I wanted to go as a success story. The first part of the reunion was Friday evening family picnic. I shouldn’t have worried about not being remembered, because as soon as I walked in the door I was recognized. Someone even told me I looked just like I did in high school. I talked to a lot of people, but chickened out at approaching others. At the end of the evening, as Kiddo was starting to show signs that he’d had enough, I found myself looking forward to the next night’s adults-only dinner. Undistracted by kids, we were able to talk to more people, and I learned a lot more about what others have done with the past 20 years. Many people still lived in our hometown, while a bunch of the rest of us had migrated west. Some people had put on weight, others had changed their hair color or lost it altogether. Some people still looked as amazing as they had back in high school. No one had cured cancer, and there wasn’t a Nobel Prize winner among the lot of us. But there were successful business owners and employees, and happy parents and spouses, and people who’d traveled to interesting places, and people who were doing things we’d never expected twenty years ago. There were a lot of people who were happy with where they’d found themselves, and who were having a great time reconnecting with old friends. By the time the dinner and dancing ended, I was sorry that it was over. I wanted to talk to the Homecoming Queen and the cheerleading captain again. I wanted to make amends with a few people. I wanted to find out more about what everyone was doing, and where they had been. Fortunately, I wasn’t the only one feeling that way. There seemed to be a lot of support for the idea of a 25th reunion, and one friend in the Seattle area has proposed a local mini-reunion. Twenty years ago, I didn’t have a lot of close friends among my high school classmates. I came away from my reunion hoping to change that, before the next time. Categories: Personal, Road Trip 2011, Travel | Tags: high school reunion, road trip | Permalink. Who on earth would be crazy enough to plan a two-week road trip–14 consecutive days–with a just-turned-2 toddler? Oh, right. That would be me. In my defense, parts of the trip had been in the works well before there was a Kiddo to complicate the plans. But after years of postponing and rescheduling, I finally said, Enough. It’s happening. We’re going to make it work. And amazingly, it not only worked, but turned out to be one of the best vacations we’ve taken as a family. 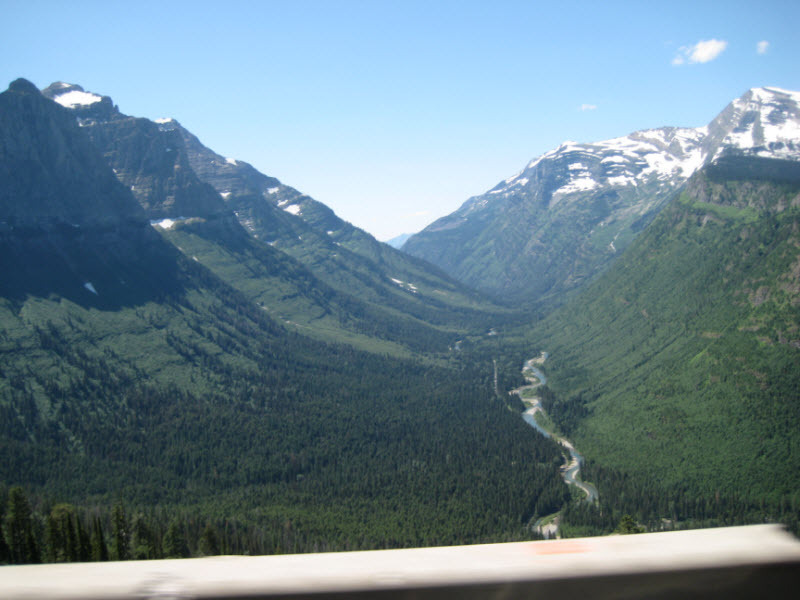 Our itinerary took us first to Glacier National Park, in the northwest corner of Montana. 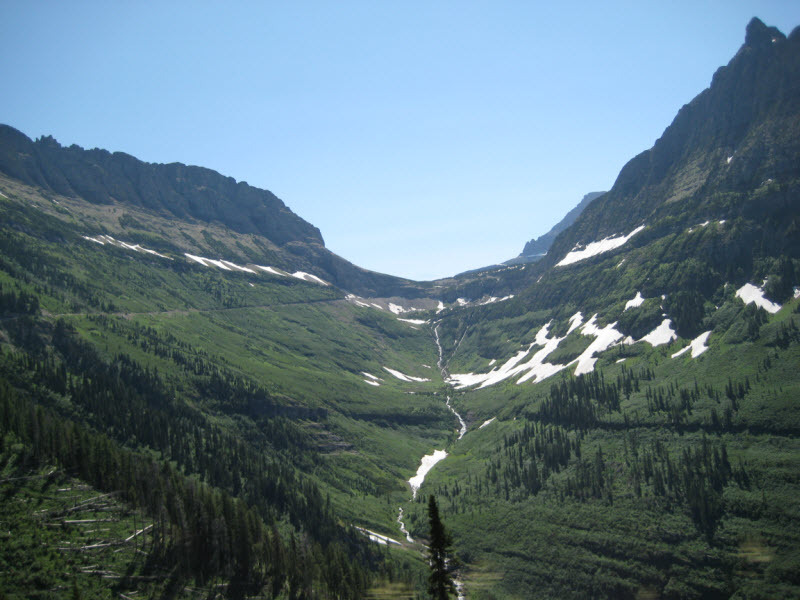 We then headed south to my hometown, Bozeman, and while there, split our time between the annual Sweet Pea Festival and my 20-year high school reunion. The following week, my parents, sisters, and I (plus husbands and kids, of course) visited Yellowstone National Park, a couple hours south of Bozeman. So what inspired this grand tour? Nostalgia, initially. When I was a kid, there were two things my family did on a regular basis: visit Yellowstone at least once a year, and spend Sweet Pea weekend hanging out at the park where the festival was always held. 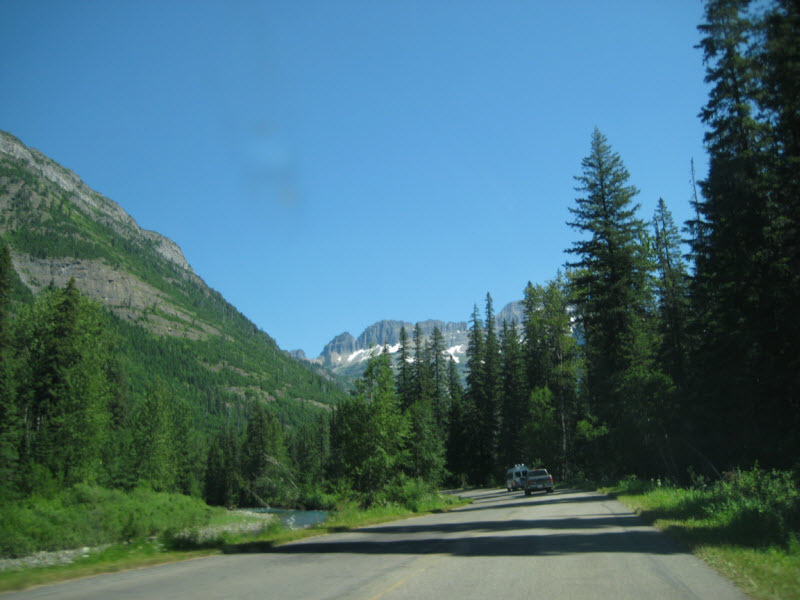 In fall 2008, I was driving on a road that reminded me of Yellowstone, and got the idea that we should take another family trip to the park and revisit some of our favorite sights. And why not schedule it adjoining Sweet Pea, and check off two things at once? 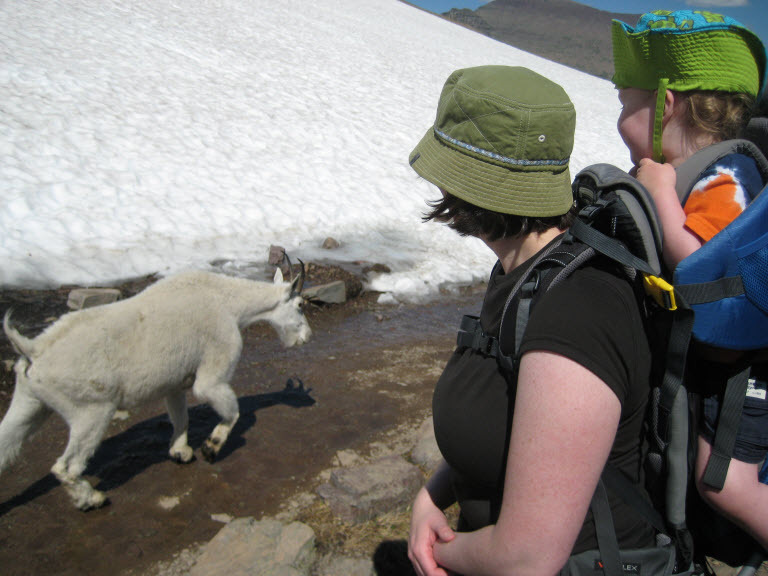 The family was on board; we set our sights on summer 2009 so that we’d have time to schedule time off from work. And then my sister and I both got pregnant about three months apart. Making that trip with months-old babies wouldn’t work out well, we all agreed. 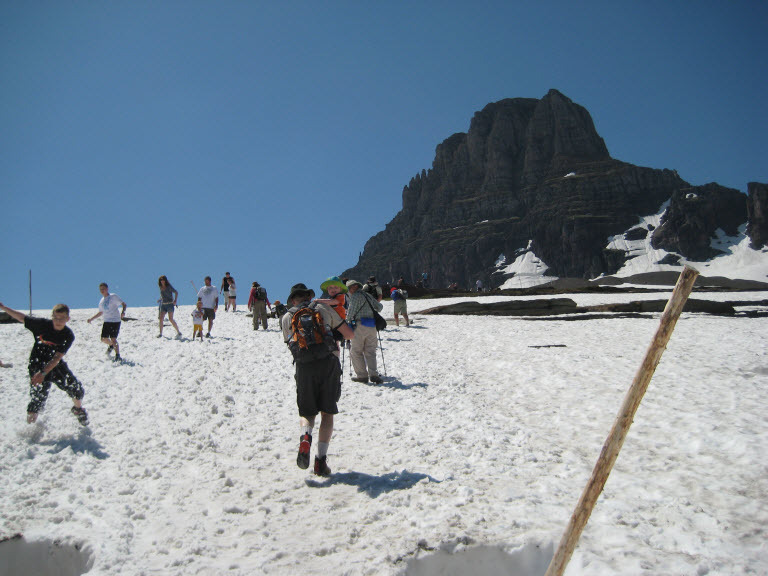 In spring 2009, we postponed the trip to the following year. 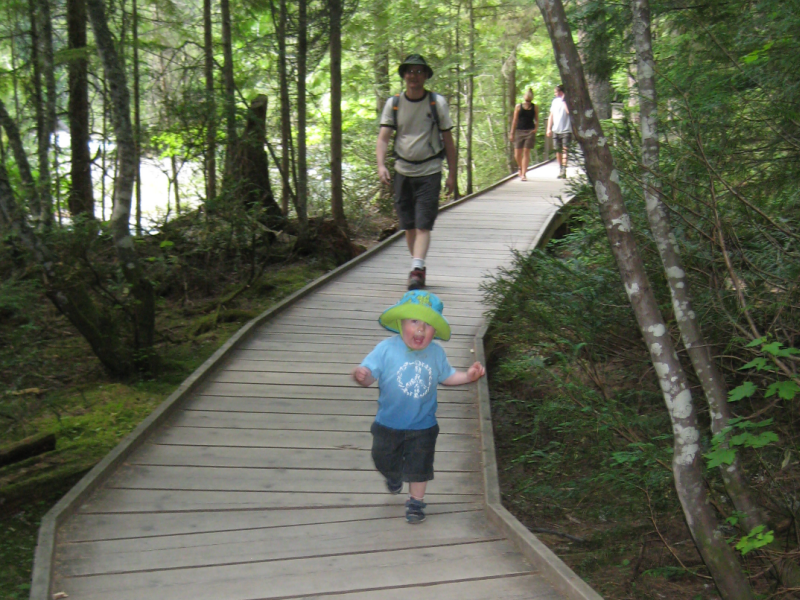 But a few months later, before I’d gotten around to booking lodging in the park, my husband’s family stepped in with their own plans for an big family August 2010 trip. They’d already picked dates and made hotel reservations when I learned about it. 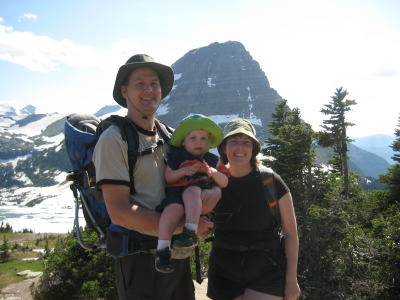 Our little family could have made both trips happen, but it would have meant taking more than three weeks off work, and taking a cross-country flight right after completing a two-day drive back from Montana–and all that with a one-year-old. I was informed that our Yellowstone trip would have to be postponed yet another year. I’ll confess that I didn’t concede this as gracefully as I could have. I’d been making these plans for a year and had postponed it once already. Now I had to wait not one but two more years? Even now I can still feel some of the ire that was bubbling back then. I reluctantly agreed, but defiantly hammered my stake into the ground: August 2011 was MINE. Whatever, people said. After all, that was almost two years away. Who knows (and who cares) what we’d be doing then? I knew. I cared. I started making plans. At first, it was just going to be Sweet Pea and Yellowstone, in some order. 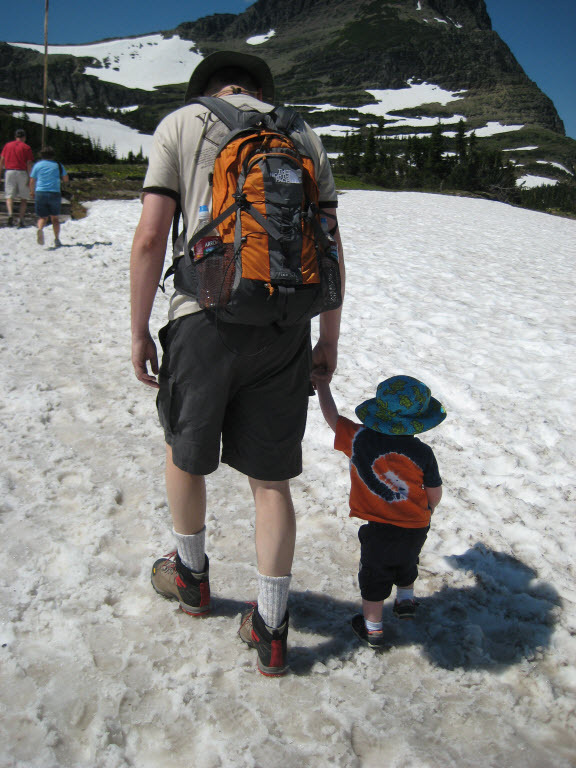 Then I remembered that my husband and I had talked about visiting Glacier Park, and that it could be doable even with a young kid. 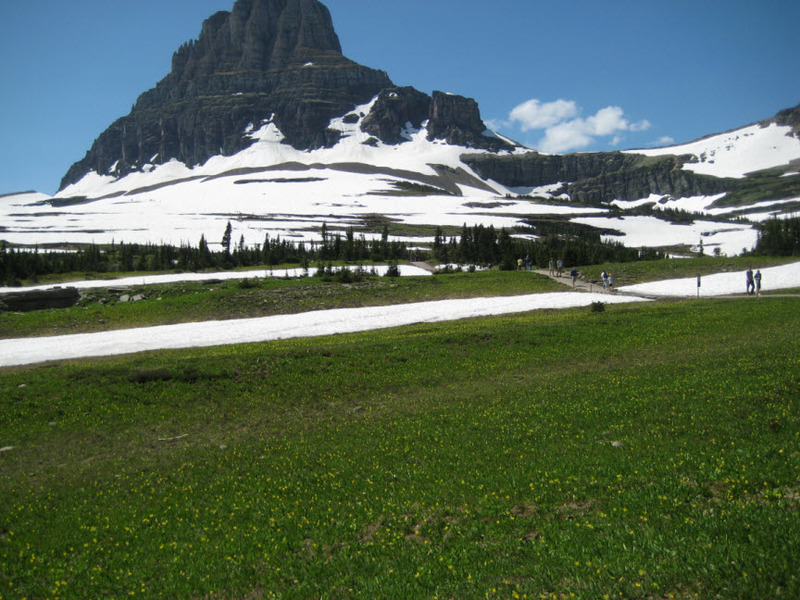 I decided we could fit a Glacier visit into whichever week we weren’t going to Yellowstone. Finally, after that was settled, my high school classmates decided to follow local tradition and schedule our reunion to coincide with Sweet Pea weekend. It was a lot to cram into two weeks. It was especially a lot considering that by the time the vacation happened, we’d have a two-year-old who needed regular snacks and naps and attention. We were worried he’d protest being cooped up in the car for hours of driving, and that he wouldn’t sleep well in unfamiliar hotel rooms. 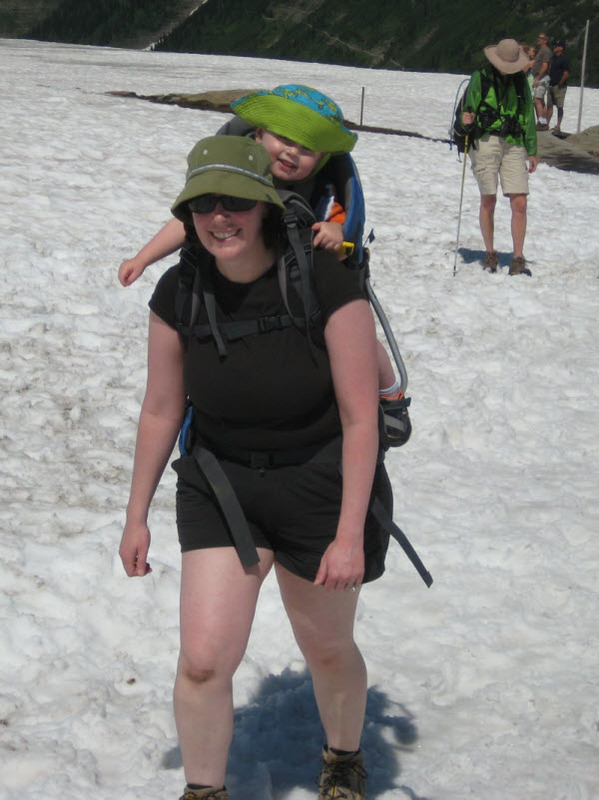 We knew his little legs didn’t have the stamina to keep up with us on hikes and geyser tours, so we’d need to make accommodations. However, I’m an organizer at heart, and I was already in the mindset that we were going to make this trip happen, come hell or high snowpack. We found some great tools and techniques that helped make things go more smoothly (more to come on these), we built in downtime for naps, and we kept an open mind toward adjusting the schedule on the fly if needed. And in the end, it was all worth it. We saw amazing sights that we’d never seen before, revisited others that I’d grown up with, brushed elbows with mountain goats, and spent rare time with family and friends. Would I change anything? Oh sure, looking back there were a few tweaks that could have been made, but nothing major. Would I do it again? Unquestionably. Categories: Family Time, Road Trip 2011, Travel | Tags: family trip, planning, road trip, vacation | Permalink.